Used to make a wide variety of Asian noodle dishes, including the famous "Pad Thai" . These are excellent quality noodles that you will enjoy very much. Please browse some of the recipes below to learn how you can use these noodles to make delicious Thai food. The noodles should be soaked in warm (hot to the touch) water for about an hour or so depending on your preference. 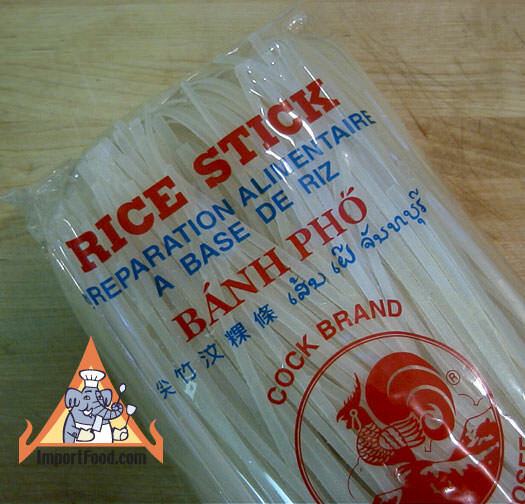 We also offer wide rice stick noodles for Pad Kee Mao. ImportFood.com's rice noodles are recommended by Mark Bittman (New York Times). We also offer rice flake for kua chap.